Before coming to Surrey, I had only lived in Florida. Even in a city as diverse as Orlando, I had not been exposed to many other cultures. I decided I wanted to change this so I applied for the University of Surrey study abroad program, switched z’s for s’s, and here I am now, finishing up an incredible and very memorable semester in the UK. When classes started, I was a bit nervous to speak out in class because I had never been a “new kid” before. I shouldn’t have worried at all though; who needs an overweight penguin when you have an American accent to break the ice? It’s practically a superpower. Lectures were harder than what I was used to at my home university (Brits love theory). All the professors were helpful, making themselves available if I needed them. Overall, I believe learning in this new environment with a diverse group of classmates, challenging coursework, and high individual study time will be beneficial to me in my future academic and professional career. Back home, the closest I ever get to traveling abroad is visiting EPCOT at Walt Disney World. In the UK, I’m just a short train or plane ride away from some of the most iconic cities in the world: London, Berlin, Paris, Rome, Amsterdam, and so many more. 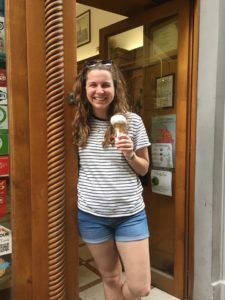 One of the top experiences during my semester was travelling across Europe for a month, going from hostel to hostel, monument to monument, and gelato stand to gelato stand, with everything I needed in my backpack. The independence and freedom I felt was unlike anything I have ever experienced in my life. 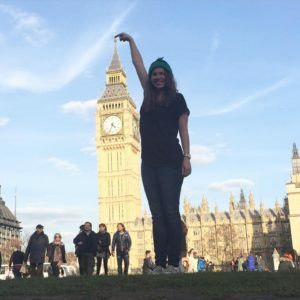 The decision to study abroad was one I did not take lightly. There were many things holding me back in my safe, comfortable, and familiar life at UCF. But why stick with the usual? Opportunities to study in a different country don’t come up every day. If I had stayed in Florida this semester, I would have regretted it. I can’t recommend taking the chance on the study abroad experience enough. Without it, I would have missed out on so many new friendships, adventures, cultural experiences, gelato, and a semester that has changed my life.